RogerBlazic.com: Are You Making An Impact On The Internet? Do You Have Klout? Are You Making An Impact On The Internet? Do You Have Klout? What is Klout? Do you have Klout? There are times I akin what we do on the Internet to doing standup comedy in a closet. "Am I funny?" "Does anyone care what I spit out?" "IS THIS THING ON?" Two questions arise, "Are you making an impact on the Internet?" and "Do you have Klout?" No, the last word of the preceding paragraph is not a typo. Do you have Klout? If you don't, you'll never know if you really have clout on the net. Klout is relatively new and offers users of the most popular Internet social sites and Google+ a way to judge how much impact they are having when they repeatedly press TWEET, SEND or SHARE on their computer. Klout will provide you with some interesting metrics as to what you are doing on Twitter, Facebook, LinkedIN and other sites. You get a graphical representation of four key areas of influence - your Overall Score, your Network Influence, an Amplification Probability and your True Reach. Numbers are generated over the past 30 days and are updated daily. Are you trending up or down? You won't know unless you sign up for Klout. It's FREE, that's always good; and it only takes a minute. No profile to mess with, which is great. It takes your Twitter info and imports it - picture, profile description, the people you follow on Twitter and your Twitter lists. Klout computes what you are Influential About, and shows the top three areas of influence you have on your profile. You can compare yourself to other people by using their Twitter screen name. I love this feature. Since I'm very active on Twitter, Facebook and LinkedIN, I get in "discussions" with people. Sometimes, the "discussions" turn into a barrage of personal insults coming back at me or a steady stream of pure BS that I don't want to deal with. I'll take the annoying tick and put their Twitter name in Klout. Invariably, I'm not the only one that doesn't care for them. Ninety-nine percent of the time, their Klout scores are taking a nose-dive over the last 30 days and I can easily make the decision to block them. What Klout gives you is a quick and easy way of gauging the impact of what you dooin the Internet and if people are responding to it. Your Klout numbers gauge how much people share and respond to your content. For anyone that is an Internet marketer, a blogger, trying to build web traffic, a news provider, a writer or a Twitter-holic, you need Klout. 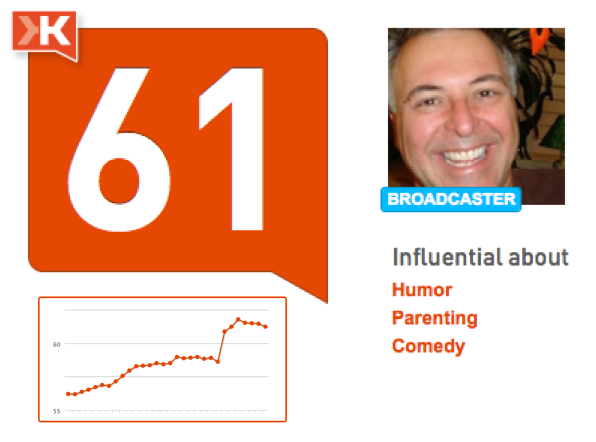 With Klout, you get a fast, easily digestible snapshot of your influence. You'll be able to figure out if you are telling jokes in the closet or if someone can hear you. Another thing I really like about Klout is that it keeps you logged in. I have it bookmarked and I can click on it and within a second I know what my clout is. The platform is simple and will only take you a minute or two to figure out, another plus. So, if you're tweeting, sharing and sending on a regular basis you can find out an answer to the first big question if you can answer YES to the second question: "Are you making an impact on the Internet?" and "Do you have Klout?" I am and I do. Compare scores. How Twitter Could Stop Spam Tomorrow. But Will They?